The samba parade held to celebrate the Rio Carnival is undoubtedly the biggest attraction on earth, with visitors from around the world flocking to Rio for a week of dancing, singing, and partying. To vibe with the rhythm of the samba the only place to be is the Rio Carnival. The Carnival is celebrated in just about every state in Brazil. While each celebration is exciting and wonderful, none of them can equal the amazing extravaganza that is the Carnival in Rio. In all likelihood, the quest to experience the Carnival once could turn out to be an annual habit for any tourist. The Carnival is the best time to experience the best of Brazilian culture, for this is one occasion that truly sums up the carioca way of life. Since 1984, the parade is held at the Sambadrome where twelve of the top samba schools vie for the prestigious championship title every year. 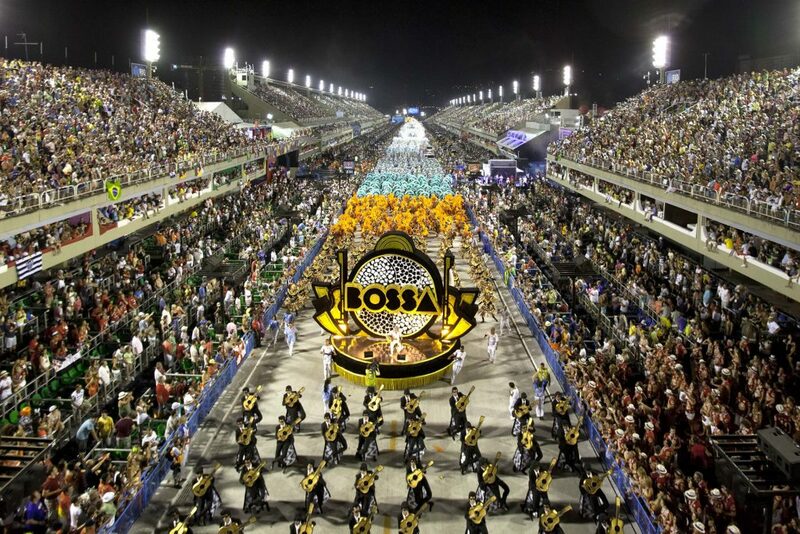 Each samba school presents a theme which is portrayed by a team of musicians, samba dancers, and well decorated floats. Months of preparation are put in by the samba schools who mobilize the support of thousands of locals from their communities. At the forefront of the preparations is the Carnvalesco or Carnival Director who sets the theme and organizes practically everything required for the parade right from the costume designs, decorations, theme song, and much more. The samba schools start planning their program next year as soon as this year’s Carnival is over. Musicians, architects, fashion designers and choreographers work throughout the year to present 80 minutes of mind blowing samba mania. Each artist puts forth his or her best effort to ensure their samba school’s show will be the most amazing of all. Each sequence in the theme is well choreographed while a panel of 40 judges keeps a close eye on each team as they parade down the Sambadrome. Points are awarded based on a number of criteria. 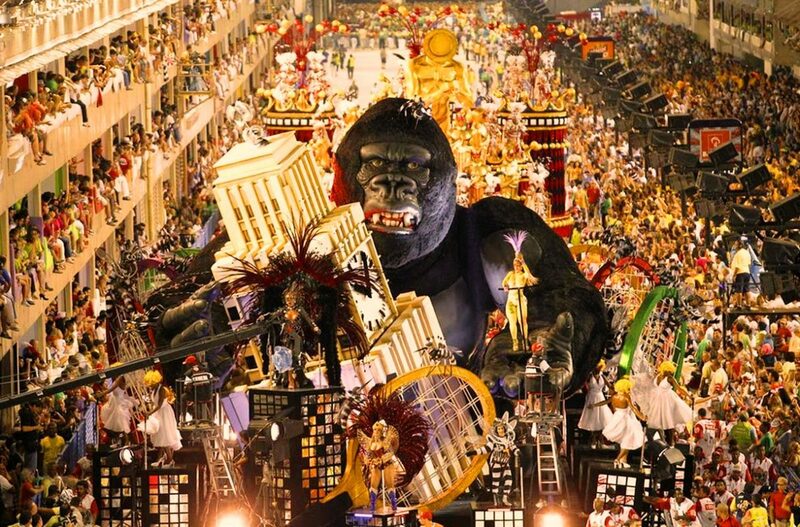 The mayor of Rio sets the ball rolling at the Rio Carnival with the crowning of Fat King also known as King Momo on the Friday leading up to the first day of Lent. Carnival fever soon spreads all over, in the streets, bars, clubs, and many other venues, culminating with the samba parade at the Sambadrome. According to Greek mythology, Momo is the god of mockery, while in Carnival tradition King Momo represents joy and posterity. Legend suggests that Momo was expelled from Olympus and settled down in Rio. Once King Momo gives the signal, it is samba time in Rio with plenty of sequins, feathers, flesh and much more. On Friday, children turn out in hoards to display their talent at the Sambadrome and host their very own samba parade. The children’s samba schools are formed by youngsters from Rio’s neighborhood communities and are enough to give the adults a run for their money were they to compete at the same level. Saturdays at the Sambadrome is reserved for the samba schools in the Access Group who compete for a place in the Special Group in the following year of competition. Samba is not just for the adults of Rio. There are many children who have committed themselves to this unique musical culture. Their interest and dedication to the Samba is destined to keep the Carnival alive in the hearts and minds of many generations to come. Unlike Rio’s infamous street parties, the samba parade is a highly orchestrated event with each individual having a particular role to play according to the school’s theme. On Sunday and Monday the 12 top samba schools that include Beija-Flor, Mocidade, Imperatriz, Salgueiro, São Clemente, Portela, Grande Rio, União da Ilha, Porto da Pedra, Unidos da Tijuca, and Vila Isabel(The number of points a samba school earns during the Sambadrome competition determines their place in next year’s competition. Those with fewer points compete in the lower groups and those with higher points strut their stuff in the elite group). On Tuesday the children’s parade take place, they are the future of the big samba schools. The following Saturday at the Champions Parade the 6 best samba schools of the Special Group from Sunday and Monday put up a splendid performance at the Sambadrome, although it is a much quieter affair.